April | 2011 | "é rayhahn, rayhahn"
In honor of the Royal Wedding, an All-Brit random list today. Here’s to the happy couple! Yeah, whatever. I swear, the PO is holding my packages and then delivering them when I’m away on my periodic business trip to Omaha. Once more, a pair of packages was waiting for me when I got home. My LCS (that’s “Local Card Shop” in baseball card blogger parlance, for those that didn’t know) got in some of this year’s Topps team sets, and besides all the Cardinals sets he picked up a Twins set for me as well. 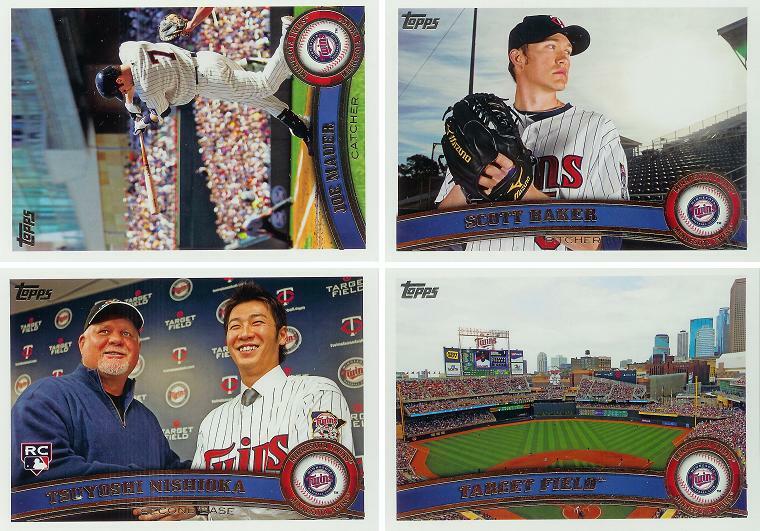 The set is 17 cards, in the same format and style as the 2011 base set, the main difference being the numbering on the back, which is MIN1 (Mauer) through MIN17 (Target Field). Several cards are the same as their series one counterparts; I’ve chosen to show some cards which are new (and will probably look like this when Topps releases series two, whenever that is). It’s nice to see Nishi’s first card here, but you know that goofball uncle of yours that tries to sneak into every picture at the family reunions? Well, Nishi has the same problem. The card shop owner thought Mauer’s card looked like a (yet another) Mickey Mantle card; meanwhile, Target Field is shown (correctly) in a way that MLB Game Day fails — packed to the gills. And in case Topps was worried that I didn’t like the set because Trevor Plouffe was included in it, there was an extra Mauer card in mine as well: BONUS! …for baseball cards to trade to reader Mike. He dropped me a comment recently asking if I had any 1974 Topps cards that he needed for his set building; turned out I did have nine of them. His trade package arrived, and in it were several 2010 and 2011 cards — some WalMart black border parallel, some Topps and Bowman Gold, a Diamond Anniversary parallel, and some base and inserts, half of which I needed and the other half definitely useful. Your ’74s will be in tomorrow’s mail, Mike. Thanks again for the contacting me, and for the cards. Tuesday night, I was again sitting at my computer and listening to the Twins radio broadcast over MLB.com streaming audio. When Dan Gladden began his preamble to giving out the game’s trivia question to PBP man Ted Robinson and the radio audience, I again quickly entered the email address (as well as my city & state this time) in my browser window and waited for the question. “Which Twin was not a ROY winner? Tony Oliva, Rod Carew, Kent Hrbek, or Marty Cordova” I slammed “Hrbek!” into the subject line and clicked the send button. Congratulations, you are the winner for today’s US Bank question of the game! Your name will now be entered into a drawing for a pair of Twins tickets. Since you have won twice, your name will be entered two times in the drawing. You will be notified should you win the drawing. The game was sucking, and I had kinda hoped to shut it down and go on to something else, but now I had to wait again to hear my name. Sure enough, “Dazzle” mentioned me as the winner (I’ll have to spell out the state next time — I don’t think he knew what MO stands for, so he skipped it). Although Kent Hrbek had a great rookie campaign, he lost out to Cal Ripken. Now on to the trade package that arrived today: (…Joe) from The Sandlot is a big Mets fan, and I loaded up on a big pile of Mike Piazza cards which sat here for quite a while until things settled out at The Sandlot. Well, (…Joe) didn’t have much for Twins, but then he sprung this beauty on me. I mean, I almost have to use foul language to describe it. Sure, it’s Perk, but come on, it’s an auto/jersey #’d to 10! I always want to be sure I’m holding up my end of a trade; I hope you didn’t pay too greatly for that card, (…Joe) — it is much appreciated. And I’ll continue to stockpile Piazzas from my digging expeditions in the boxes at the back of my LCS. Thanks again for the trade. Lately I’ve made a couple quick trades, based on cards I’ve recently picked up, or found at the LCS. Two packages arrived the other day: one was the result of one of these quick trades, but the other took quite a while to complete. Found a 2011 Topps Silk Rockies card at the LCS the other day, and gave hiflew from Cards from the Quarry a shot at it. While, he didn’t have a Twins card to exchange, he offered a handful of Buy It Now cards from eBay worth roughly the same, and the Liriano relic below is what I selected. A trade couldn’t have gone smoother. With the sudden migration of The WGOM to a new location, several suggestions for the future were made for what things to continue, what to change, what to retire, and what new to add. I used to handle the “library” there, but I think I’ll expand it to cover collectibles of all kinds. One idea for a post that I’d been sitting on and decided to pull out as a new post there (and also here, while I’m at it) concerns a handful of similar cards that caught my eye regarding a former Twins ballplayer. I noticed a while back that the various baseball card companies have been pretty single-minded in their choices for front photos for Shane Mack’s baseball cards. Shane was a popular (and good) ballplayer with the Twins, and if you collected baseball cards in the early ’90s, you’d know that he was quite the hustler on the base paths. To the left is his 1991 Upper Deck card #188. Until someone proves to me otherwise, Shane Mack is the king of the head-first slide horizontal baseball cards.